This seems to be yet another example of how Amir Khan spins a good yarn, but his version of events just doesn't hold water. Here's a letter that went out today to parishioners at the Holy Eucharist Parish, which is "seeking possession of the property" from Khan. This is a pretty cut and dried version of events. Solid Rock fell behind in rent so the Parish sought court action for possession of the property. The court said Solid Rock had to pay the back rent AND pony up the full purchase price by January 3, 2012. If not, the Parish was entitled to a "Judgement of Possession", ie. they get the property back and Khan gets evicted. So Solid Rock had between June and January to make it right, and they failed to do so. But to hear Amir Khan's version of events you would think that all is well with the world! Give him just a couple more weeks and he'll be right back on top! Surprised by news of the court action, the Rev. Amir Khan, pastor of Solid Rock, said Friday that he received a lender's verbal commitment for the funds two weeks ago and will have a written commitment by next week. Solid Rock, a nondenominational, predominantly African American congregation, will pay the full purchase price plus the back rent at settlement, the pastor said. "Technically, I have nothing until I have the written commitment," said Khan, who still expects to close the deal with the parish and is moving ahead with enrolling students in the charter school. Surprised? There was a court order that gave him until January 3rd. Why is he surprised? How long did he think the Parish was going to be strung along? Remember, Khan also runs an 85 child day care on the premises as well as Solid Rock and Nehemiah Group. If the income from his private school, his church and Nehemiah aren't enough to support the property, clearly Khan NEEDS the tax dollars from the charter to be able to afford the property. And this video is just unreal. Go to about the 2:06:00 mark. Khan brings up the full time staff from Solid Rock and acknowledges them for their loyalty. He goes on to describe how, in the past year, they have often been working without pay. Khan says that they have had to ask the employees of Solid Rock to "hold the check" or they have had to "put money in the kitty" for them until their "final breakthrough comes and we do the mortgage and finish up the things we're doing with the charter school." Not only is he not paying the rent, he isn't paying his employees. And not for nothing, but why should anything having to do with the charter school have ANYTHING to do with the finances of Solid Rock?? But hey, if the employees of his church want to work without pay, that is their prerogative. And we've seen that the mortgage industry has done some crazy things, so I won't be surprised if Amir Khan actually does get his mortgage. And that is just fine with me. I have no qualms with Khan's church, private school or Nehemiah or how he runs any of those entities. But how can the NJDOE continue to entertain the idea of giving Khan over $2,000,000 of taxpayer's money for Regis Academy? Especially when it will be taken DIRECTLY from districts where the majority of parents aren't interested in Regis Academy? Some residents "have said they don't want Regis Academy here, but it's probably a small handful of people who have the biggest voice,"
But the fact remains that a petition against Regis Academy got over 2,000 signatures in 2 weeks. His best estimate is that in 5 months Regis Academy has received 80 applications. And read some of the comments after you sign it. This is more that just a handful of people. And isn't it interesting that on Friday he told the Philadelphia Inquirer reporter that he has 80 kids enrolled, but that same day I received an OPRA request stating that Regis still hadn't submitted their enrollment data to the Office of Charter Schools? See the pattern here? Amir Khan seems to be able to deny the precariousness of his present circumstance and project himself into some time in the future where everything will work out just fine. I posted about the world of trouble Amir Khan is in, and the story hit the Philadelphia Inquirer and the Courier Post too. My blogging buddy Jersey Jazzman wrote about the situation as well, and asked some pointed questions about how the NJDOE missed the fact that Amir Khan seemed to need the charter to pay his bills. So how did this happen? How did Regis Academy get approval to open a charter school when it seems that their foundation is so unstable? Allow me to digress for a moment and I may be able to provide a bit more clarity on this. I reached out to our local branch of the NAACP and received a fantastic letter of support which was published in the New Brunswick Patch. It is the position of the NAACP National Organization that any institution or system, such as charter schools or vouchers, which siphons funds from the coffers of public education, will be a detriment to student achievement in public schools. This position has been outlined in resolutions presented to and ratified by its membership over the course of the past 5 years. So naturally, when I started helping my new friends in Cherry Hill and Voorhees I told them I would be happy to reach out to the NAACP in their area and see if we could get a letter of opposition to Regis. That's where I hit a brick wall. See, it turns out that the leadership of the Camden County East NAACP which has jurisdiction over Cherry Hill didn't get the memo about the NAACP national policy on charters. In fact, the President on the branch, Lloyd Henderson, is on the Board of E3, and the Vice President of the Branch, Keith Benson, is an outspoken school choice advocate. The decline of our nation's educational system has also negatively impacted every aspect of society, both domestic and international relations. Undoubtedly, a fundamental prerequisite to restoring our founding principles, enumerated in the Declaration and the United States Constitution, is the restoration of our "unalienable right" to choose the education that best meets the needs of our children. He is also the President of an organization called Save Our Children NJ. The organization's website is pretty thin on content and there seems to be very little information out there about them other than that they support the OSA. And now here's where it get's really interesting. Keith Benson was also a charter school application reviewer. In fact, he reviewed applications in the controversial October 2010 Expedited Application Cycle along with E3 notables Shelley Skinner and Derrell Bradford. This was the cycle when five members of the Black Minister's Council, including Rev. Reginald Jackson, applied for the first time. And let's not forget that Rev. Jackson's wife, Christy Davis Jackson, now heads up E3. Man, I'm already dizzy. But let's keep going. While I can't find too much else about Reverend Washington, a quick Google search does turn up an interesting press release. It's titled Alliance of New Jersey African American Ministers Urges Support for the Opportunity Scholarship Act, and it is signed by Amir Khan, Lester Washington, Reginald Jackson and Dr. Therman Evans, among others. Although Amir Khan's Regis Academy was denied in the round that was reviewed by Washington and Benson, Reverend Reginald Jackson's Arete Charter School and Dr. Therman Evans' Promise Charter School of Excellence were approved. Regis Academy was approved in the very next round in September of 2011. Perhaps the NJDOE didn't want to be so obvious as to hand out approvals to too many of the charters members of the Black Ministers Council applied for in one round. Instead, they spread them out over a couple of rounds. And while Derrell and Shelley claimed that applications were vetted for conflicts and decisions were ultimately made by the Department, it's awfully hard not to notice how reviewers and applicants all seem to be swimming in the same small pond. And to tie it all up in with a nice little bow, Therman Evans was in attendance at a November 15, 2011 meeting where Amir Khan answered the many critics of the Regis Academy Charter School. And guess who moderated the meeting? Keith Benson. So, it looks like Amir Khan got a hold of an email that went out from Voorhees Schools about the Governor's now infamous Voorhees Town Hall. If you look at the time stamps, he almost immediately shot off an email to the Governor's Office. In the email he defends himself in an almost paranoid fashion, and seems to be preparing the Governor for a possible onslaught at the Town Hall. Notice how quickly the email gets flagged and forwarded around the Governor's Office, ultimately ending up with the Legislative Relations folks, Pete Sheridan and Bridget Kelly. It's seeming less and less likely that the Governor had NEVER heard Amir Khan's name before, isn't it? But the email was originally sent to Brandon Brice. Brandon has served as the Director of Education and African American Affairs in the Dept. of Intergovernmental Affairs in the Office of the New Jersey Governor. Brandon is a member of Republicans for Black Empowerment, and is the former spokesperson for HipHopRepublicans.com. Amir Khan's email to Brice does not include a "Dear Mr. Brice" or any other greeting for that matter, which to me implies that there is an established relationship between the two men. This certainly explains Amir Khan sitting right behind the Governor at the Voorhees Town Hall. Even if the Governor can legitimately say he doesn't know Amir Khan (although I doubt it), Amir Khan certainly has easy access to the right people with the right connections to get a seat under the "Jersey Comeback" banner. And clearly there is a simpatico relationship between the members of the Black Ministers Council, the Camden County East NAACP, E3, the NJDOE and the Governor's Office which lead to the approval of Khan's Regis Academy Charter School. And now that I have put Khan's email to the Governor's Office out there, I just have to address some of the content. Pastor Bills has stated very clearly that he did not write the letter of support. In addition, reports made it very clear that Amir Khan DID have people staying on the property. Platt said the township also learned that the church may potentially be renting out rooms, which Keashen said, violates the zoning ordinance. Khan said he is not renting out rooms to individuals anymore. In September, he said, he placed an advertisement in a local newspaper. He said the church is planning to use one of the buildings as a school, and before it was set to open in the fall of 2011, he considered using the space as housing. Is there any doubt that Amir Khan was given this charter school because of who he knows? Is there any doubt that Amir Khan needs the income from this charter school to keep his entire operation afloat? Is there any doubt that if the Governor and Acting Commissioner Chris Cerf allow this charter school to open it will be an unmitigated disaster? I just keep coming back to Amir Khan's own words. "It was a thought, and it didn't work." Let's hope the Governor and Acting Commissioner come to the same conclusion about Regis Academy and deny the final charter. 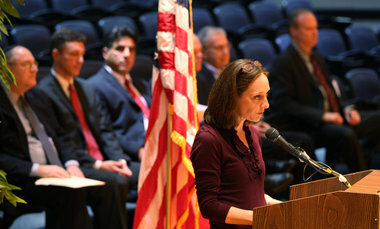 On March 12, 2012 Regis Academy held a Board of Trustees Meeting. Let's take a look at the Minutes from the previous meeting on February 6, 2012, shall we? The U.S. Supreme Court in January announced that it will not hear an appeal of a 2005 lawsuit brought by a Jewish family who challenged the invocations at meetings of the Indian River School District. The high court’s refusal to hear the case brings the matter to a close. The 3rd U.S. Circuit Court of Appeals had earlier ruled in the Doe v. Indian River School District case that since students often attend the school board’s meetings, the official prayers are a violation of church-state separation. The meeting was held on February 6, 2012 and says "there are 47 applications in at this time." Also, there was conversation as to whether they should admit students from districts other than their original four sending districts, and if so, from which districts. However, as I posted last month, on February 15, 2012 Christian Barnes submitted enrollment data stating Regis had enrolled only 37 students, and they came from eleven districts! So why are there less kids than were discussed at the Board Meeting? And if the Board hadn't yet decided whether they wanted to accept kids from other districts, why did Amir Khan send a letter to Deputy Commissioner Andy Smarick on January 26, 2012 with an expanded list of districts complete with estimates for each district? Did Amir Khan go rogue? Since then Amir Khan has given any number of estimates in interviews as to how many students have enrolled and how many applications they are getting per week. You'll forgive me if I take these numbers with a grain of salt. Especially when Regis hasn't submitted the district by district enrollment data the Office of Charter Schools has asked for not once, but three times. And the combination of these two sections from the minutes is simply unbelievable. The addition of Camden students may deter enrollment. We need to be sure that the sending districts are not bringing in children who may cause a great concern for the AYP. We must make sure that school performance out performs, based on your curriculum. “One of our goals for our school is diversity. The department of education was impressed by the diversity of our board. Our goal is to bring school districts together,” Khan said. In the heated debate surrounding Regis Academy Charter School, which is slated to open in Cherry Hill next fall, one important point is often overlooked: No school works for every student. That's why all families, no matter where they live, deserve a choice of publicly funded schools. Looks like Khan is pretty good at talking the talk but not walking the walk. So let me see if I have this straight. All families, no matter where they live, deserve a choice of publicly funded schools and districts should be brought together. Just as long as those kids from Camden don't deter enrollment or drag down Regis' AYP. Acting Commissioner Cerf, are you paying attention to this? I warned you about the problems with the Tikun Olam application, and even though they had a $600,000 federal grant you didn't approve them. I applaud you for that. Now I am warning you about Regis Academy. There are real problems here and if you grant Regis a final charter it is almost guaranteed to blow up in your face. Let's call it three strikes and Regis is out, whaddya say? Eviction Proceedings Started For Second Time; Will Regis Academy Lose Facility? Camden Diocese Spokesman Peter Feuerherd has confirmed that on March 14, 2012 eviction proceedings were filed against Solid Rock Worship Center over the Holy Rosary Church complex, future home of the Regis Academy Charter School. And this is not the first time. An eviction lawsuit was settled in June of 2011 after Solid Rock failed to pay rent several months in a row. This time around Mr. Feuerherd confirmed that Solid Rock is in arrears $20,000. Adding fuel to the fire, I received an OPRA request today confirming that Regis Academy has yet to make the required corrections to the enrollment data that was submitted to the Office of Charter Schools on February 15th. Lead Person Christian Barnes failed to provide the Office of Charter Schools with a district by district breakdown and instead just lumped all of the enrollment together. Between the eviction proceedings and the seeming refusal of Regis Academy to provide the district by district enrollment data as requested, it would seem that Amir Khan and Regis Academy are in a world of trouble. And it sure seems like Acting Commissioner Chris Cerf rolled the dice on the wrong charter application. I can't help but think about how poorly the reviewers rated the application, yet somehow Cerf decided to give Regis Academy the green light. Following a careful and stringent three-stage review and approval process for new charter school applicants to evaluate the quality of the proposed educational program, the capacity of the founding team to implement that program, and the need for the proposed school in the community. Except this really isn't funny at all and has very real consequences for the districts involved. Cherry Hill has been forced to put aside almost $1,900,000 for this travesty. And as reported in the Courier Post, as of February 15th, only five Cherry Hill students had submitted applications to attend Regis Academy. That comes to $380,444.67 per student. Trenton Insider And Princeton Charter School Trustee Not In Favor Of Local Control. What A Surprise!! An op-ed in today's Asbury Park Press is a pretty typical piece of reformy writing. Paul Josephson comes out of the gate swinging with reformy talking points. Heck, "status quo" is in the title of the piece! It drones on in much the same fashion, finger wagging at typical reformy targets, teachers' unions and school boards. Opponents of public charter schools are wasting obscene amounts of our taxpayer funds on lobbyists, lawyers and political advisers to fight public charter schools. Their mission: to preserve the current education establishment and ways of doing business, by preventing parents from creating better and more innovative educational opportunities in their towns with a public charter school. Teachers’ unions and school boards across the state have scared parents and teachers with the mantra that public charter schools are robbing their districts of revenues. They want taxpayers to believe that public charter schools are to blame for reductions and layoffs. They prefer to vilify charters and avoid responsibility for the real reforms and tough choices we need to make. Save Our Schools New Jersey, backed by well over 6,000 parents, is the driving force behind the legislation Mr. Josephson is denigrating. But Save Our Schools New Jersey is not anti charter, and Mr. Josephson knows that. In fact, it isn't a secret that Julia Sass Rubin, one of the main spokespersons for Save Our Schools NJ, has a child that attends the same charter as Mr. Josephson's two children, Princeton Charter School. Save Our Schools NJ, is a grassroots organization led and run by parents - not unions or school boards - and works to ensure that local communities have a say in whether they want a charter. I have testified before both the Senate and Assembly Education Committees. The only fancy lobbyists I have seen were Carlos Perez of the New Jersey Charter Schools Association, with lobbyists from the National Association of Charter School Authorizers and the National Alliance for Public Charter Schools in tow. They testified against local control and hobnobbed with NJDOE officials in the hallway. They had fancy suits and glossy brochures, and more Walton, Gates and Robertson Foundation money behind them than I could ever imagine seeing in my lifetime. So, Mr. Josephson, where's the proof to back up your statement that "opponents of public charter schools are wasting "obscene amounts of our taxpayer funds on lobbyists, lawyers and political advisers to fight public charter schools?" Exactly who is Mr. Josephson anyway, and what game is he playing here? At the bottom of the op-ed it says he is a trustee of the Princeton Charter School. Check out his bio on the schools website. Now we're getting somewhere. Not exactly a Trenton outsider. So, let's see, what does Government Process Solutions LLC do? Well, there you have it. Mr. Josephson is using the op-ed page of the Asbury Park Press to "provide a unique and creative solution" to a "government problem." Namely, that parents in the state of New Jersey are showing how powerful their voice is, and have become a "difficult public affairs challenge." What better way to squelch that voice then to claim that the driving force behind the legislation is actually unions and school boards. Much better targets and easier scapegoats, especially in New Jersey under Chris Christie. Strange that someone that's a member of the Citizen's Campaign Legal Task Force, which claims "to teach citizens about the legal rights and political skills they need to bring constructive, responsible leadership to the service of our communities and our country" would lash out this way against legislation that is being driven by public outcry. Parents, not the school boards and the teachers unions, are making it hard for the actual powers that be, namely the Governor, Education Commissioner Chris Cerf and the big money backers of the New Jersey Charter Schools Association, to jam their agenda of more charter schools down the throats of New Jersey parents that support public education. We're not going away either. Mr. Josephson purposefully has it backwards. Clearly, this guy is not a novice. He knows his way around the charter school issue, the media, and the Statehouse. This op-ed is nothing but a smear campaign. Looks to me like Mr. Josephson is protecting his own status quo. After all, Princeton Charter has been around since 1997; it is one of the oldest charters in the state. Perhaps now that the tide is turning on charters, especially those in the suburbs, he is feeling like he needs to defend his school. In fact, just recently the Princeton School Board did an analysis and stated they believe they could save $3.15 million if the Princeton Charter school was absorbed into the regular public school system. Gee, I am sure the taxpayers in Princeton are interested in that number. Could there be any other reason he wants to keep traditional public school parents from asking too many questions? Let's take a quick look at the kids Princeton Charter School is serving. Looks a lot like they are "cream skimming" off of the traditional public schools, doesn't it? Perhaps the backlash against "boutique charters" in suburbs, which has even Governor Christie and Acting Commissioner Cerf questioning the need for charters in successful districts, has Mr. Josephson a little nervous too? In his argument against local control Mr. Josephson threw out a huge red herring. He tried desperately to make the argument that because the majority of school boards decided to move their elections to November, thus doing away with the need for voter approval on school budgets if districts stay within a 2% cap, school boards are being hypocritical to support voter referendums on charters. Perhaps the most far-reaching consequence is districts that switch their elections to November are no longer compelled to put their budgets before voters for approval, provided they stay within the 2 percent tax levy cap. Any requests for spending above the cap would be presented to the voters in November. So Mr. Josephson, clearly you are trying to obfuscate the facts here. The tax burden of any new school, charter or traditional public, should be put to the voters. And not having to put the budget up for a vote every year is not a get out of jail free card for districts. If the budget needs to increase more than 2%, or a new school is needed, the budget gets voted on. I'll make you a deal. You subject your charter school's budget to the will of the people for as many years as the traditional public schools in Princeton have. Spend months and months preparing it, only to have each line item scrutinized, and folks come out just to vote it down because they don't want to pay ANY taxes for public schools let alone MORE taxes! And then deal with a bully of a Governor telling those same taxpayers to vote down your budget and see how you make out. What's that? No thank you? Well, I can't blame you. The charter status quo is pretty sweet. It must be awfully nice to get public dollars, not have to educate the same population as the rest of the district and not have to deal with public scrutiny to boot. Check out today's piece by the Washington Post's wonderful Valerie Strauss about the failure of parent trigger legislation in Florida. Like I said, Mr. Josephson's reformy talking points aren't terribly original. Looks like legislators may finally be catching on. NJDOE Conducts A Careful And Stringent Approval Process? Now THAT Is Funny! Way to conduct a careful and stringent approval process that gauges the "need for the proposed school in the community" guys! Regis Academy Districts… Ummm... Un-Expanded? The Courier Post ran an article today stating that the NJDOE has denied Regis Academy Charter School's request to expand to districts other than Cherry Hill, Lawnside, Somerdale and Voorhees. As I detailed in my last post, in a January 26th letter Amir Khan asked Deputy Commissioner Andy Smarick for permission to expand to other districts and gave estimated enrollment projections for the original four sending districts, as well as four more. Susan Bastnagle, Public Information Officer for the Cherry Hill Public Schools, confirmed in the article that just this week the NJDOE sent Cherry Hill a revised enrollment projection based on the numbers Khan proposed in the January 26th letter I received via OPRA. Bastnagel added that the district is still unsure of how to budget, because it received two more Regis enrollment projections from the DOE this week in addition to the original one of 169. This week’s numbers are 186, based on the district’s own enrollment data for the grades that would be operational at Regis this fall, and the 50 suggested by Khan. She said Cherry Hill Superintendent Maureen Reusche has asked the DOE which number it plans to use to determine the district’s payments to Regis, which are to begin July 15. Really? This is how the NJDOE functions? The week before district budgets are due Cherry Hill gets not one but two enrollment projections and the NJDOE can't tell them which to use? Based on the $1.9M for the original projection of 169 students, the NJDOE is telling Cherry Hill to budget somewhere between $562,100 for 50 kids or $2.1M for 186 kids. I have also confirmed with the Superintendent of Lawnside, Dr. Ronn Johnson, that Lawnside also received a revised enrollment projection based on Amir Khan's January 26th letter. This ups Lawnside's total from $54,858 for 4 students to $262,112 for 20 students. In 2010-2011 Lawnside had 283 students. If Khan manages to enroll the 20 students he projects, that's 7% of Lawnside's student population and over 3% of their total budget based on the 2011-2012 projected budget numbers available on the districts website. Khan said he would like to open the school to students from other districts to help make the situation more palatable for Cherry Hill and Voorhees. “It would ease the financial burden on them,” he said. The relatively affluent suburban school districts of Cherry Hill and Voorhees have nevertheless argued that because their students perform just fine on state tests, a charter school would be an unnecessary burden on their budgets. Huh, doesn't sound like he is really too concerned about "easing the financial burden" on Cherry Hill schools, now does it? In fact, it sounds like he feels entitled to that money somehow, and how dare those "affluent suburban school districts" fight back! And upping the ante for Lawnside sure isn't considerate of the financial burden on that small district. So why is Amir Khan asking the NJDOE to pull kids from other districts? Could it have more to do with this? The Cherry Hill district has learned, through an Open Public Records Act request, that just five of the applicants were from Cherry Hill as of Feb. 15. FIVE! Cherry Hill is being asked to budget perhaps as much as $2.1M for the 2012-2013 school year when in five months Regis Academy has received applications from FIVE students. I checked with the OPRA custodian yesterday and she said that to date they have not received a response from Regis Academy. Khan said that as of Thursday, there were 65 applications in — just over 50 percent of them from the original four districts. Our recruitment numbers are on track. In fact, we’re ahead of the game. So between a press release on October 10th and the initial enrollment submission on February 15th, Regis Academy was supposed to conduct Information Sessions throughout the region, post admission information, make applications available, and conduct three enrollment periods with lotteries if needed. Notice that after February 15th Regis is supposed to move on to hiring staff, notifying districts of transportation needs and adopting and submitting their budget to the NJDOE by the end of this month. How in the world can they do this based on the enrollment of 37 students? Even if Amir Khan is being truthful when he states in the Courier Post that he now has "65 applications in — just over 50 percent of them from the original four districts," that still puts him back to about 37 students! Also notice that June 1st is the final day for late enrollments. If Regis needs 90% enrollment from it's four host districts to get it's final charter, that means they will need to enroll another 188 kids between now and June 1st. Now here is the $64,000 question. If the NJDOE denied Amir Khan's request to expand Regis' sending districts, why did the NJDOE send out revised enrollment estimates based on Amir Khan's projections in his January 26th letter? Cherry Hill confirmed in the Courier Post article that they received the revised bill for 50 students, and the Lawnside Superintendent confirmed to me in an email that he received the revised estimate of 20 students on Tuesday! Isn't it funny how my OPRA request didn't turn up a response to Amir Khan's letter from Deputy Commissioner Smarick or any other NJDOE employee? So let's review what has transpired between January 26th and now and see if the NJDOE has been living up to their claim that an application can't be amended. At the public information session on February 16th Amir Khan told those in attendance that Regis was given permission to expand it's districts. He even bragged that now he could take kids from Hoboken if he wanted! The letter from the Office of Charter Schools on February 23rd says NOTHING about limiting the districts, just that a district by district breakdown is needed. The districts of Cherry Hill and Lawnside confirmed that just this week they received revised bills based on the numbers in Amir Khan's letter. Kind of flies in the face of the NJDOE's claim that they denied Amir Khan's request and that an application can't be amended, doesn't it? I suppose this is just par for the course. Acting Commissioner Cerf's NJDOE does whatever they want, whenever they want, to whatever district they want, the laws and regulations that govern charter schools be damned! All the while coddling and cajoling unproven charter operators.